Operation Once in a Lifetime receives thousands of requests a month from Active Duty Service Members and Veterans. 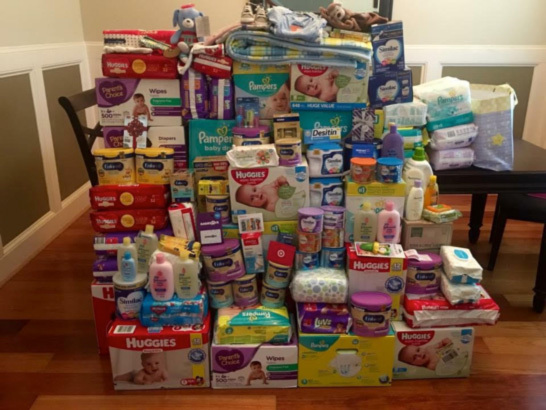 Currently our Operation Baby Shower Program is the most requested program right now with over 400 requests a month from military spouses looking for support. 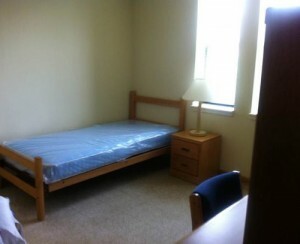 Many people don’t know that often single soldiers living in the barracks come home to empty barracks rooms, with just a bed, empty wall locker and bathroom. 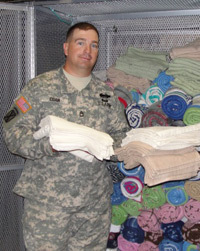 Our goal is to supply each barracks room with new twin sheets, pillows, pillow cases, towels, toiletries (soap, shampoo, razors, etc) and snacks so that when these soldiers return from war, they can relax instead of catching a ride to Walmart to purchase these needed items. 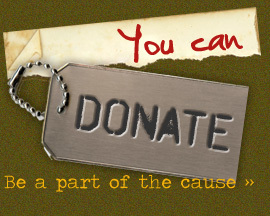 For every $30 we raise we can outfit one soldiers room and we have over 300 soldiers that we are trying to help. Operation Once in a Lifetime receives on average over 200 requests a week from Active Duty Service Members and Veterans all across the United States in need of help. These requests range from food/grocery needs, rental assistance, utility assistance, emergency flights home and more. Unfortunately, we never have enough funds to fulfill every request, as each year we receive almost $10,000,000 in requested assistance. Our goal in 2019 is to fulfill at least 10% of the requests we receive by trying to raise $1,000,000. This Current Needs Story will show the exact amount of donations we receive through one time donations, recurring donations, donations made on other Current Needs Stories, donations made by mail and our website throughout 2019. Thank you so much for your support and helping us make 2019 a record year! 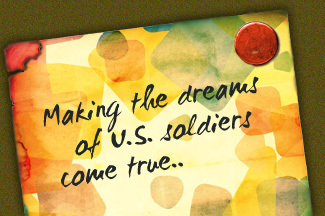 Operation Once in a Lifetime received a request from a military family in need of help. SPC Starkey is currently deployed for a year in Poland and left behind his wife who was pregnant and due in August. He was fully prepared that due to military service he would miss the birth of his daughter but he was not prepared for his daughter Hope to be born 3 months early and be in the NICU during his deployment. 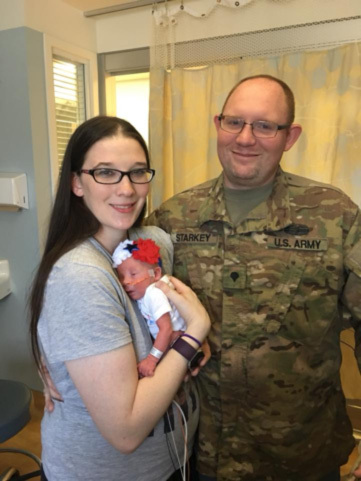 SPC Starkey’s wife reached out to Operation Once in a Lifetime asking if there could be any way they we could help assist SPC Starkey to come home as his unit granted him 13 days of maternity leave. Unfortunately the military did not classify this as an emergency so SPC Starkey has to pay for his own flight home to Kentucky and a last minute flight home from Europe is thousands of dollars his family did not have. Thanks to the support of Operation Once in a Lifetime and those that donate to our organization SPC Starkey made it home. This is just one of hundreds of requests we are able to fulfill with the donations we receive. Operation Once in a Lifetime is currently raising funds for our fourth annual “Operation Closure” Trip to Arlington National Cemetery. Serving in the military can be tough, and one of the toughest things about serving in the military is when you lose one of your fellow soldiers. Many people don’t understand that when you lose one of your brothers/sisters in war, the body is sent back home, the burial is back home, the funeral is back home, but you are still deployed. So many Veterans have lost friends and have never had that closure that they long for as they have never been given the opportunity to visit Arlington National Cemetery to visit the resting spot of their fallen comrades. Help Operation Once in a Lifetime fulfill one of our biggest endeavors we take on annually as we try and bring 50-60 Veterans from WWII, the Korean War, Vietnam War, Dessert Storm, Iraq and Afghanistan to Arlington National Cemetery for their very first time. We have over 60 Veterans and Active Duty Service Members already signed up wanting to go on our 4th Annual Closure trip in May 2019 and many more e-mailing daily. For every $750 donation, you can help sponsor one Veteran to visit Arlington National Cemetery and help them pay their respects to their fallen brothers. Watch the video below of one of our previous Closure Trips and the impact your support makes. Help Operation Once in a Lifetime make holiday dreams come true for military families in need of assistance during the Thanksgiving and Christmas season. For every $50 donation, we are able to provide a full holiday meal to a military family. 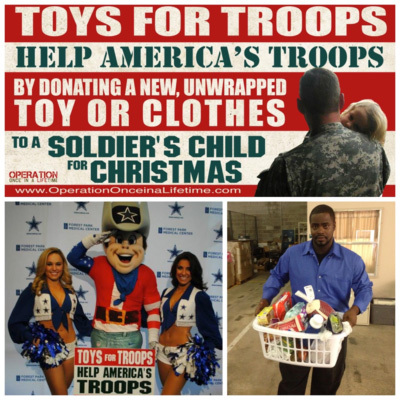 For every $10.00 donation we receive, we can help give a toy to a child in need. For more information please email staff@operationonceinalifetime.com.